Originally constructed by the dwarven outcast Banz Schteinkopf a couple of centuries ago, these caverns have seen a lot of different residents since. The two colored sludges have been there for a long time, created by an alchemist who was funded by a local lord to produce explosives. However, the lord would not allow such experimentation to take place in proximity of his land and keep so the caverns seemed a good spot to set up the lab. Many years later, some goblinoids moved in. One evening, when they woke up, a huge snake with the head of a humanoid female was staring at them. She bade them kneel, and they did. In fact so overwhelming was Her charm that they did all She asked, and fought each other in order to please Her when orders where absent. Now, years later, She has charmed a priest into service. Together, they await an oncoming constellation when the Serpent is high and the waning moon is low on the sky. Then all the bottles, vintage and fresh alike, will be decantered just so onto the altar, and the Dutchess of Serpents will appear, and lo, all the poison and guile and violence of snakes shall be imparted upon them. Yes, the time draws near. 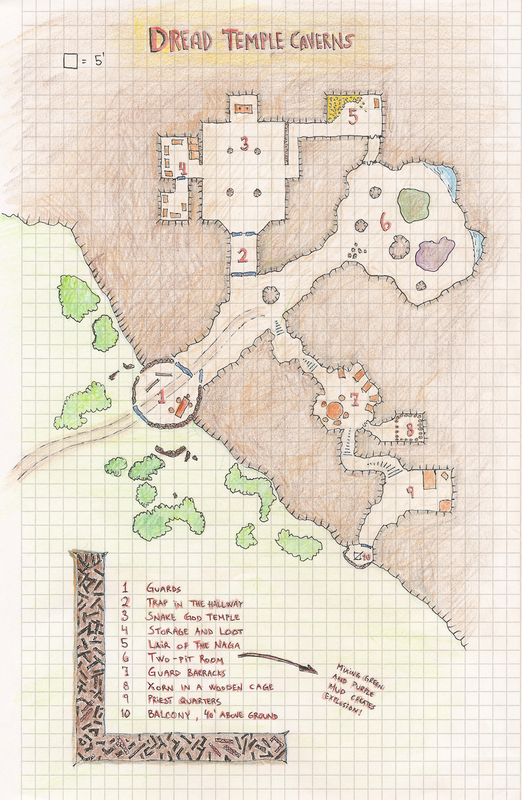 As luck would have it, a band of adventurers stumble upon these caverns. Will they be in time to stop the sanguine ritual? Or will they succumb to Her charms, and fill Her belly and Her bottles, like so many before them?